I am a huge advocate of making the home a beautiful place inside and out!! 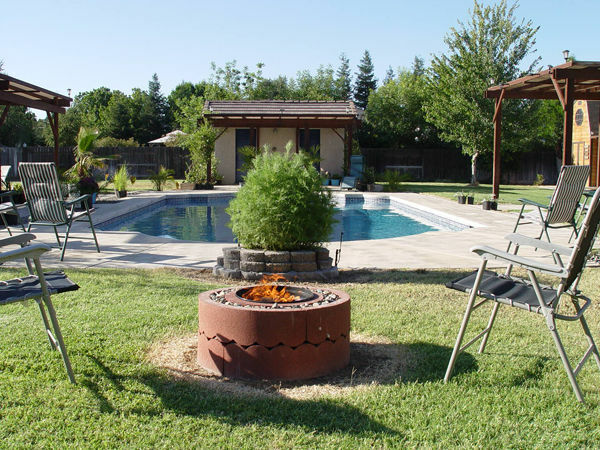 I want my family to love spending time together, which is why I think an outdoor fire pit would be such a fun addition to the backyard. After looking through a bunch of tutorials, I’m convinced that this is a project that anyone could tackle and be successful. 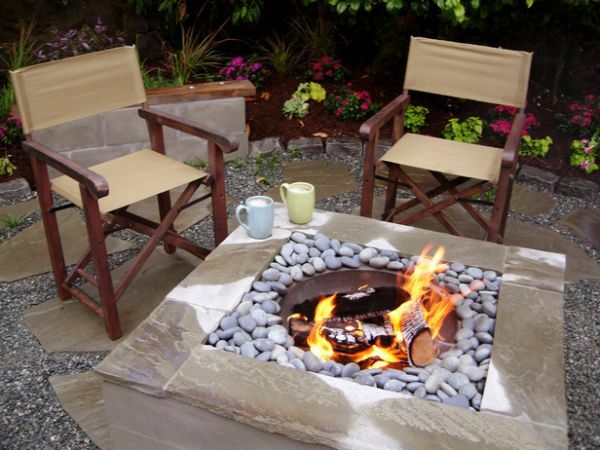 Hope you enjoy these Outdoor Fire Pit tutorials and find some incredible inspiration for your yard here today! 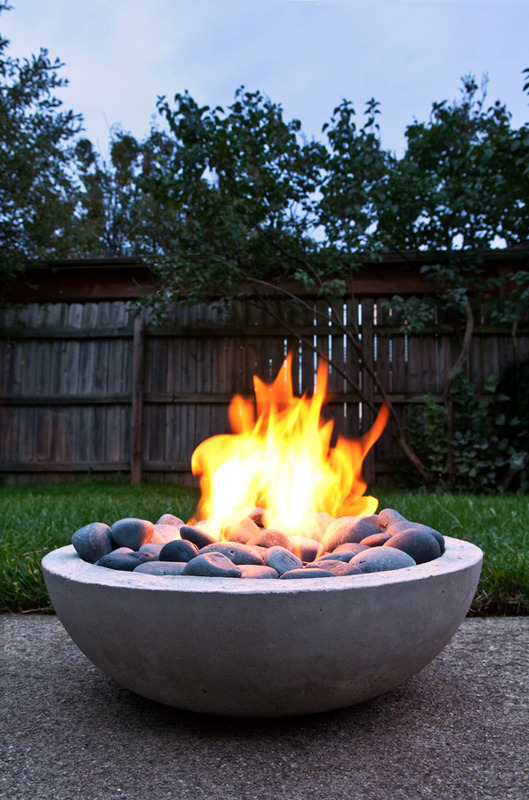 This fire bowl is incredible!! I cannot believe that this is a DIY project, but the instructions from Man Made make it look so easy! I wouldn’t mind gazing into this fire on a warm summer evening! This pit from A Beautiful Mess can be made in just 4 easy steps and it is AMAZING!! Love the whole set up. Especially the contrast of the white bench! Party anyone?? 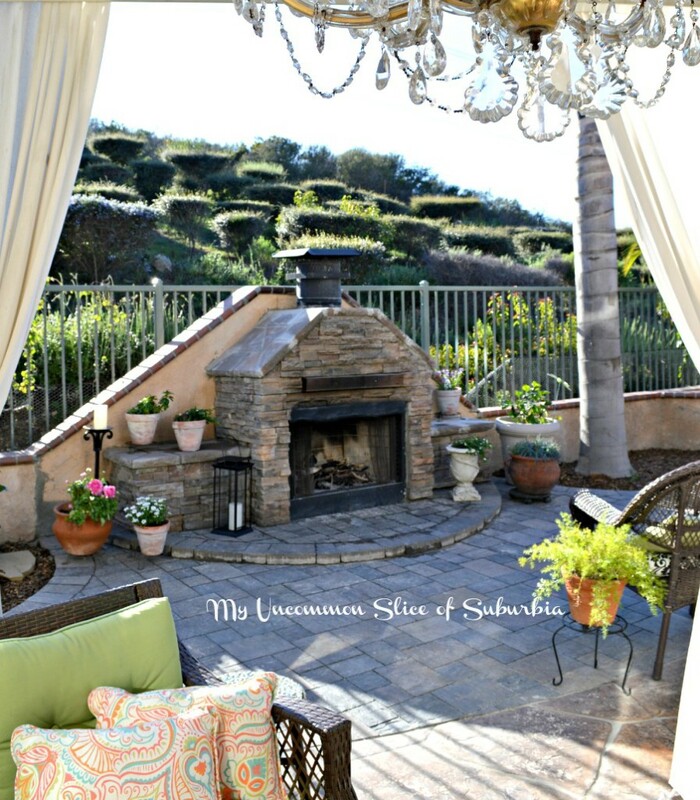 This outdoor fireplace has so much seating it would the perfect place to host a S’mores party or bonfire! 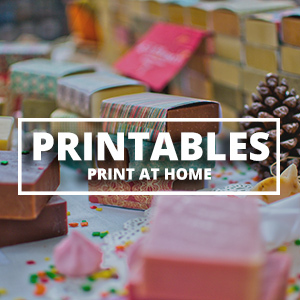 Instructables is sharing a detailed tutorial so you can make your own party place! 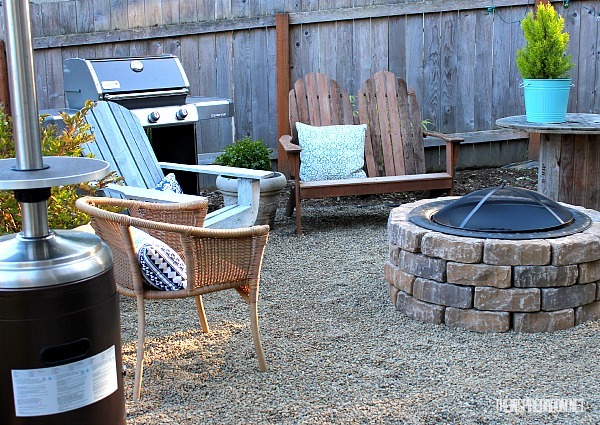 The Garden Glove shows how to make this easy backyard fire pit so that you can have a nice place to sit back and relax at the end of the day!! 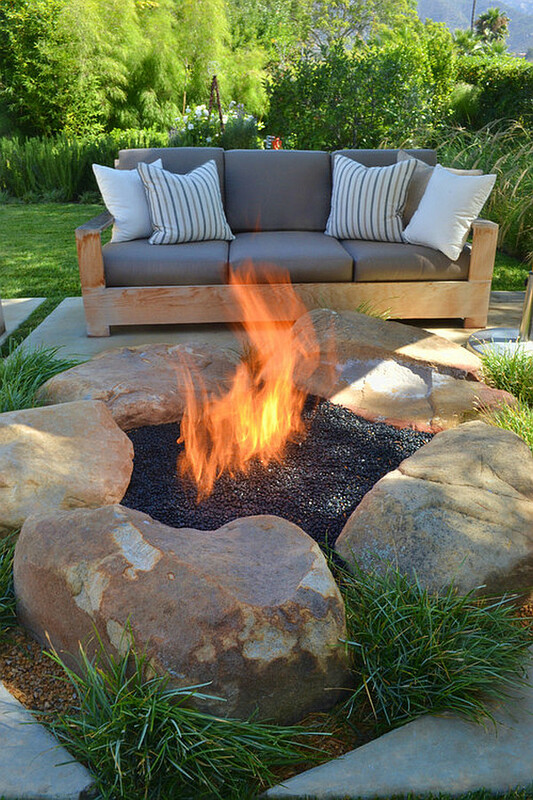 I love how unique this outdoor fire pit is just because of the shape! 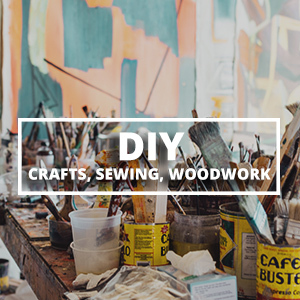 The DIY Network has all the details on how to make this a part of your backyard. 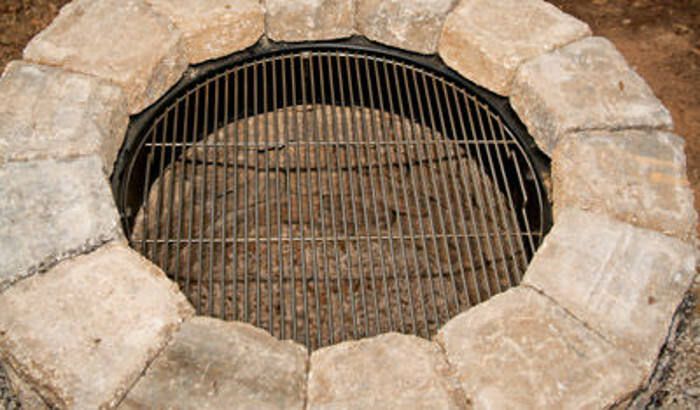 If you are looking for a different look, maybe the submerged fire pit is for you!! 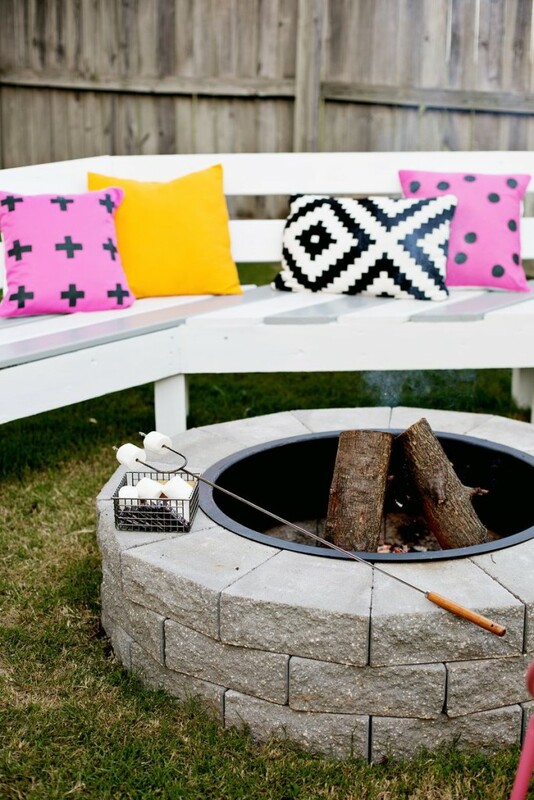 It sure looks pretty, however, you would definitely have to be very careful having little ones around a fire pit like this! 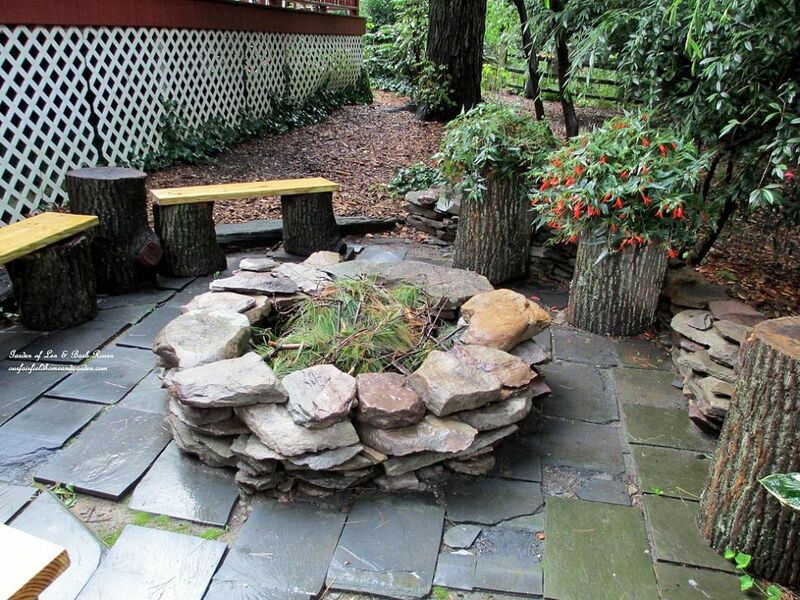 I love the natural look that this fire pit has with the overlaid stone. Isn’t the whole set-up so relaxing?? 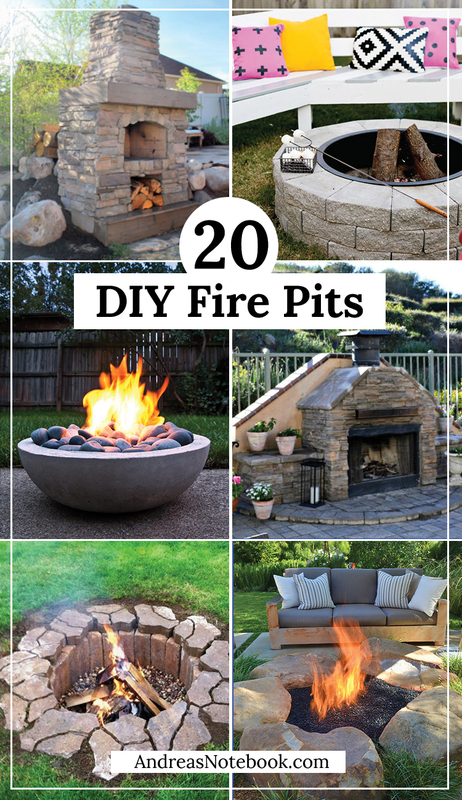 The Bower Power blog gives some insanely detailed instructions and pictures to help you DIY this amazing stone fire pit. They actually used retaining wall blocks to build up the outside of the fire pit. Another great picture tutorial from The Harpster Home. 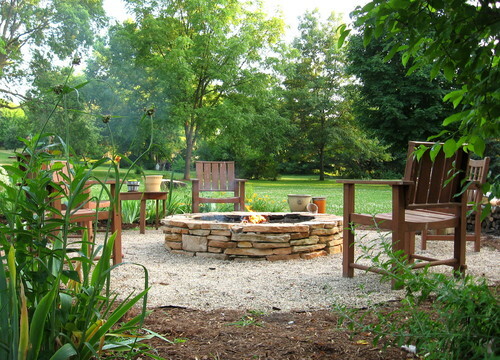 I love the use of the gravel in and around the fire pit. I can only imagine how great the fire would look in this pit… instead of the dog!! This would be a dream fireplace for many!! It is huge and gorgeous. Here are the instructions from My Uncommon Slice of Suburbia. That’s right!! 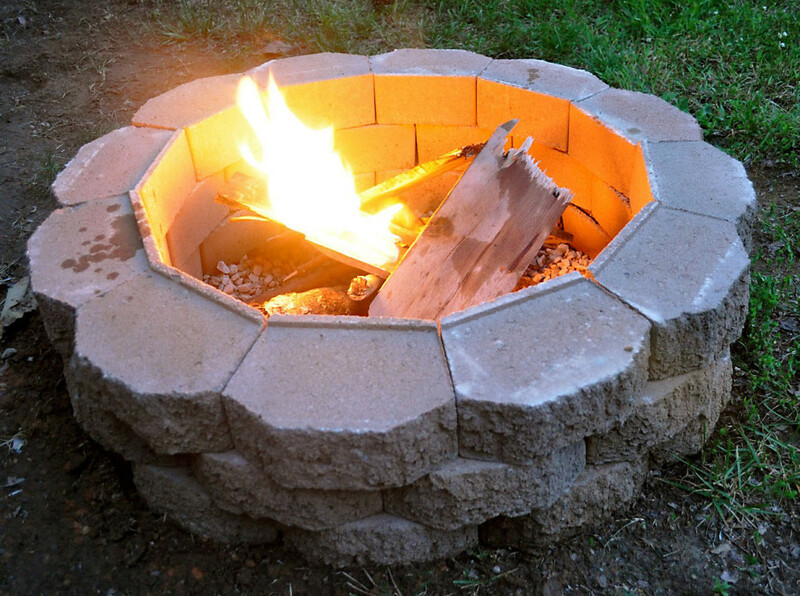 This outdoor fire pit is a quick and easy pit to put together. It looks clean and really compliments the surroundings. Plus, you can move it!! How cool is that? 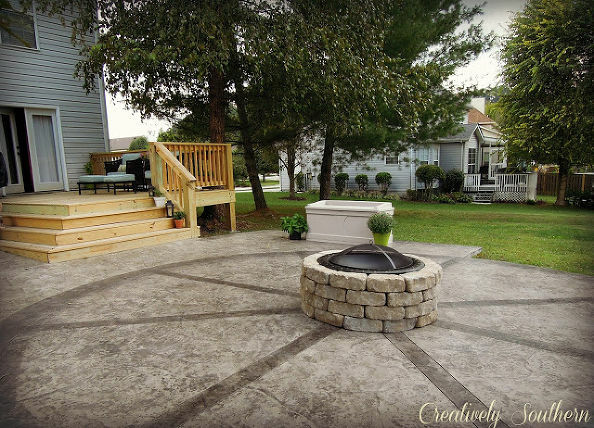 This outdoor patio area with a fire pit looks amazing and the look is easy to achieve. 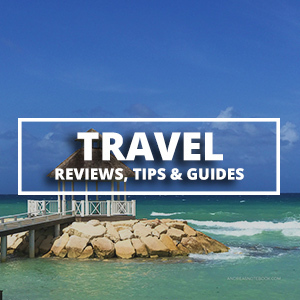 Check out how from The Inspired Room. 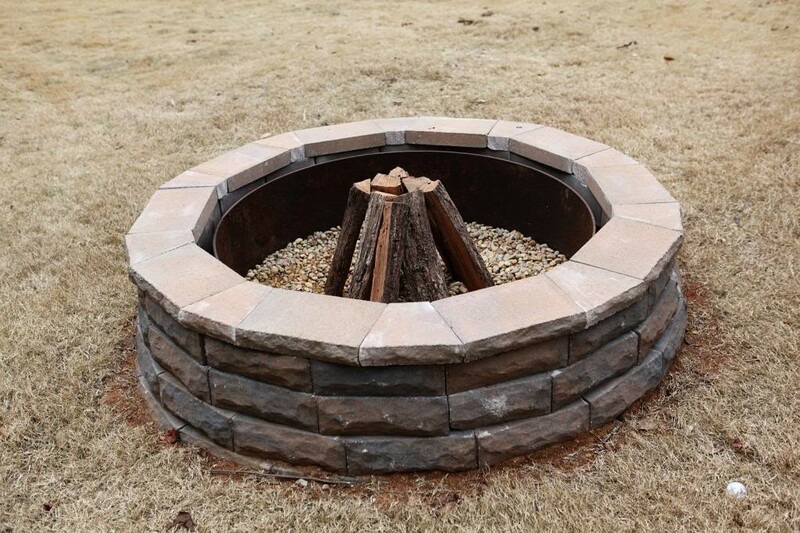 Depending on how you want to use your fire pit, you might want to use a steel ring so that you can grill, as well as sit back and enjoy the flames! The steel ring helps you do just that! A fireplace from Sweet Pickins Furniture with built in storage! This would be a great addition to any patio! 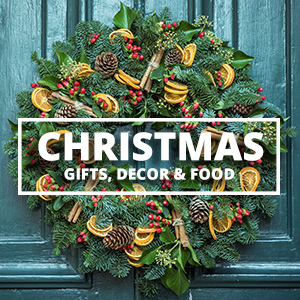 Want to create a big gathering place for family and friends? 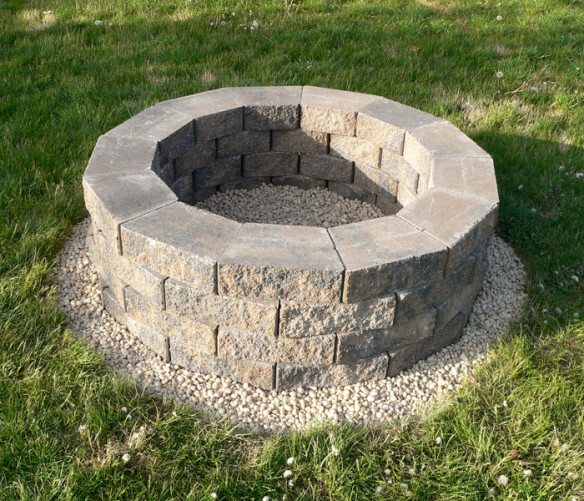 The stacked stones are beautiful… Plus, imagine how many marshmallows you could roast around this pit!! I love how Sharpe Creations personalized their fire pit!! This is such a great idea and turned out beautiful! I love the red here!! 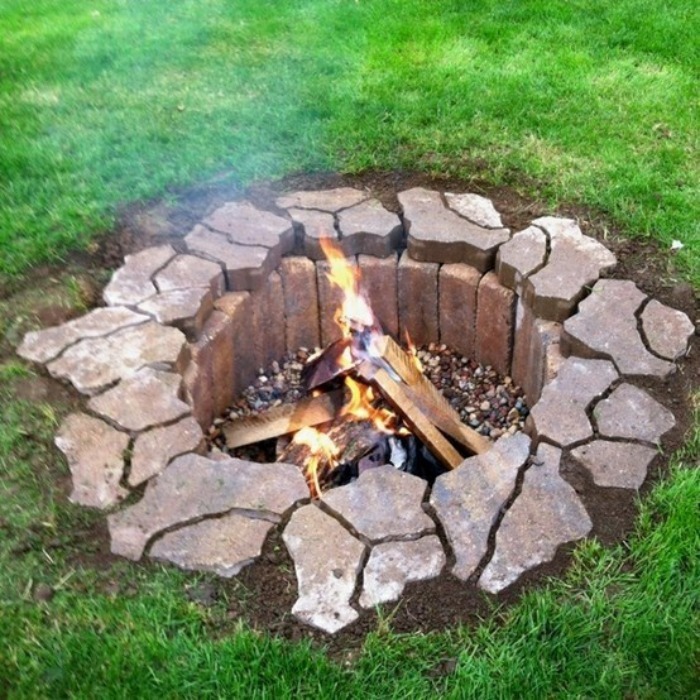 Using the concrete tree rings definitely gives you a different look on this outdoor fire pit from Instructables. 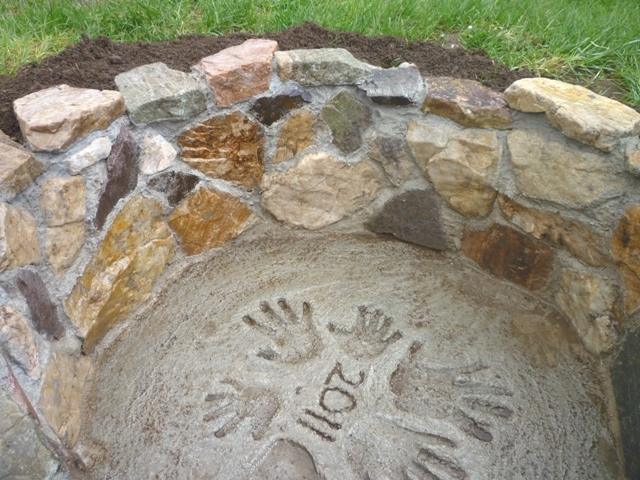 Check out how beautiful this fire pit is just using stones in their natural shape. You would need some pretty strong helpers to get this fire pit set up! 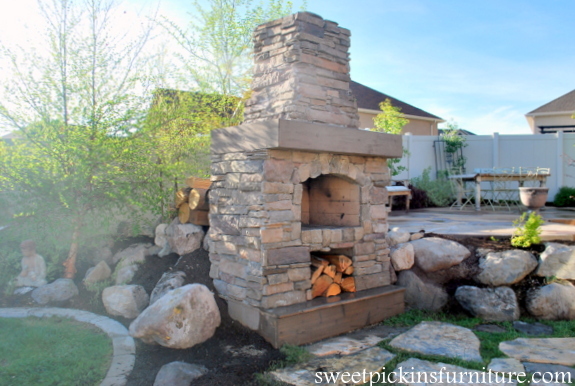 Here is another outdoor fireplace that would be a an incredible addition to the backyard!! 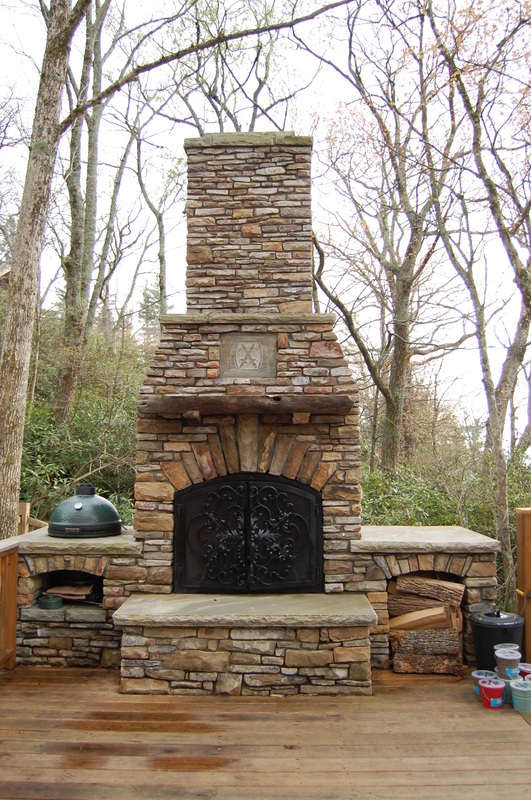 Living Stone Masonry has all the details on how to create the stunning fireplace. 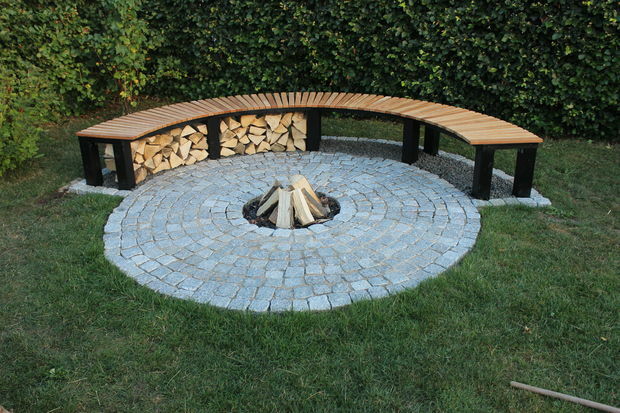 This is such a great idea and would work with almost any of the fire pit designs. 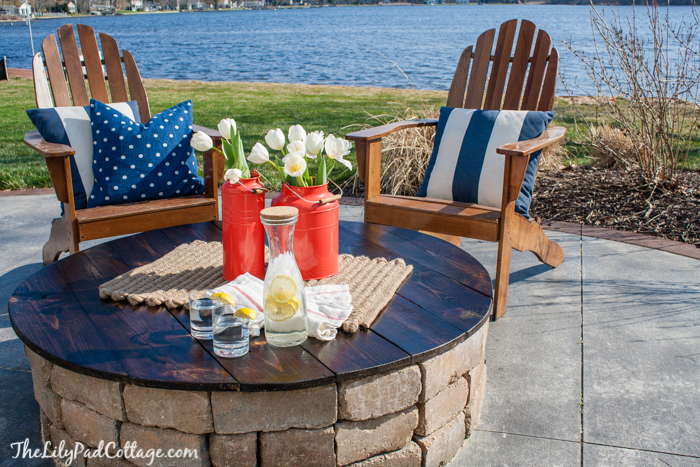 The Lily Pad Cottage shows how to make a fire pit table top so that your fire pit looks great even when it is not in use!! Plus, it serves as an extra precaution for any kids you might have running around! Garden Fireplace is the perfect place for having some fun with friends and family in the winter. I like it. 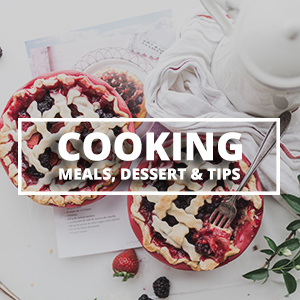 We’re going to have a night camping next week and these tutorials are absolutely perfect for us!